There has been a robust debate as to whether or not the pancreas has a stem cell population. Several studies suggested that the pancreatic duct cells could differentiate into hormone-secreting pancreatic cells. Unfortunately, when the cells of the pancreatic duct are marked, they clearly never contribute to regeneration of the pancreas. According to an article that appeared in the journal Developmental Cell by Oren Ziv, Benjamin Glaser, and Yuval Dor entitled “The Plastic Pancreas,” tying off the pancreatic duct kills off the acinar cells, but it leads to a large increase in the number of hormone-secreting beta cells. Something seems to be contributing cells to the adult pancreas. 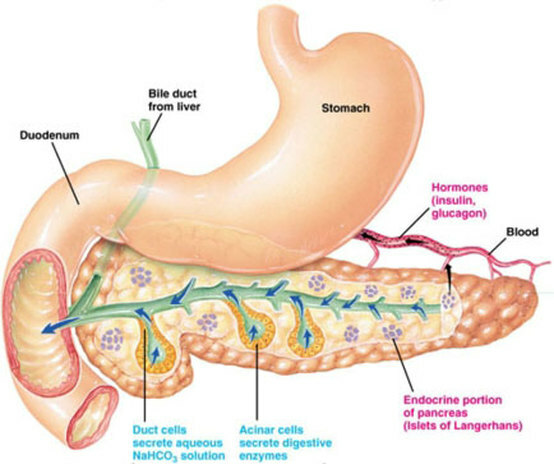 However when lineage studies tried to confirm that the pancreatic duct cells formed the new cells, it failed to find any connection between the new cells in the pancreas and the duct. Recent experiments from Chris Wright’s lab suggest that the acinar cells are a population of progenitor cells that divide and differentiate into different kinds of pancreatic cell types after injury to the pancreas. A similar result was observed in work by Desai and others. If that’s not odd enough for you, another set of experiments from Pedro Herrera research group has shown once all the insulin-secreting beta cells are killed off, the adjacent glucagon-secreting cells transdifferentiate into insulin-secreting beta cells. Therefore, something interesting is afoot in the pancreas. All these experiments were done with rodents. Whether or not they are transferable to human remains uncertain. Nevertheless, a fascinating paper in EMBO Journal from Hans Clevers lab at the Hubrecht Institute, Utrecht, Netherlands haws succeeded in culturing pancreatic precursor cells. Here’s how they did it. Clevers and his crew took the pancreatic duct of mice and partially tied it off. In order to stem cells from the digestive tract to grow, they must upregulate a signaling pathway called the “Wnt” pathway. The Wnt pathway is quiet in the pancreas, but one the pancreas is injured, the Wnt pathway swings into gear and the cells begin to divide. When Clevers and company dropped pancreatic duct tissue into culture, Wnt signaling activity soared and the cells grew into a mini-organ (organoid) that resembled and tiny pancreas in a culture dish. In fact, a single cell taken from the pancreatic duct could be cultured into an organoid. 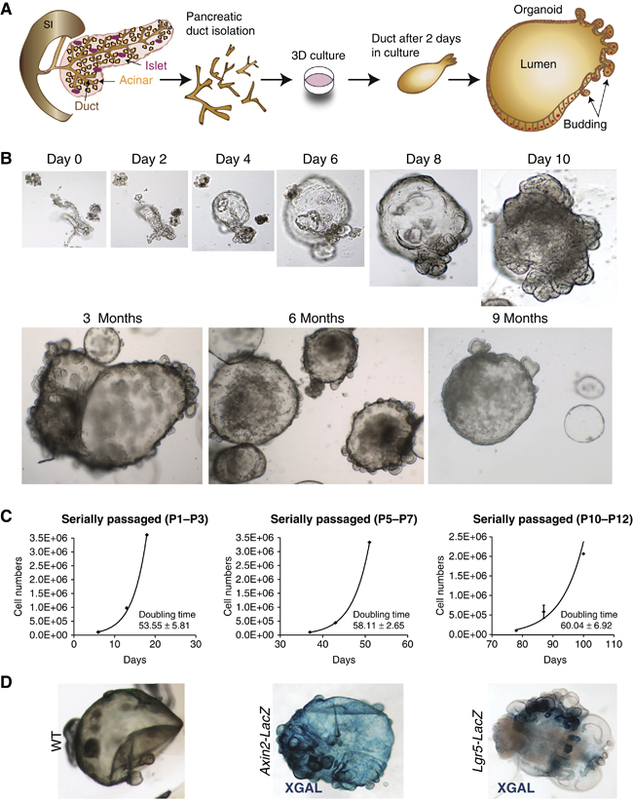 Establishment of the pancreas organoids from adult pancreatic ducts. (A) Scheme representing the isolation method of the pancreatic ducts and the establishment of the pancreatic organoid culture. The pancreatic ducts were isolated from adult mouse pancreas after digestion, handpicked manually and embedded in matrigel. Twenty-four hours after, the pancreatic ducts closed and generated cystic structures. After several days in culture, the cystic structures started folding and budding. (B) Representative serial DIC images of a pancreatic organoid culture growing at the indicated time points. Magnifications: × 10 (days 0, 2, 4, 6, and 8) and × 4 (day 10 onwards). (C) Growth curves of pancreas cultures originated from isolated pancreatic ducts cultured as described in Materials and methods. Note that the cultures followed an exponential growth curve within each time window analysed. Graphs illustrate the number of cells counted per well at each passage from passages P1–P3 (left), P5–P7 (middle) and P10–P12 (right). The doubling time (hours) is indicated in each graph. Data represent mean±s.e.m., n=2. (D) Representative DIC images of XGAL staining in WT (left), Axin2-LacZ (middle) and Lgr5-LacZ (right) derived pancreas organoids. Can this work with human pancreatic duct cells? That is the $64,000 question. Clevers and his groups will almost certainly try to answer this questions next. If Clevers and his crew can get this to work, then the possibilities are vast indeed.